As a news junkie/a self-appointed cultural historian of the here and now when I heard a few months ago when President Obama floated the idea of tossing out the Cuban Embargo, the last rusted relic of the Cold War my wanderlust got the best of me. 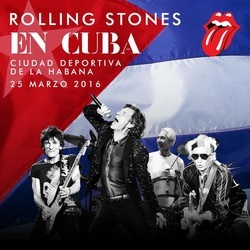 Then a few weeks ago I saw on Facebook my friend Renate Winter (a real one, not just a virtual friend of my 1,001+ on my own Facebook friends) post “Rolling Stones En Cuba” for the Forgotten Island’s people on the 25th of March at Ciudad Deportivo De La Habana. I immediately called my friend Boyd Elder and relayed the news, "Wow man, that is a trip of a lifetime!" he said pondering the possibilities. Like his friends the Eagles sang, we were "already gone!” He and I were mentally packed, but most others would agree, “loosely packed” would be a better description. We only had two weeks, if we were actually going to pull this off, to make it happen. Time was of the essence. My expired passport was in the top drawer of my desk. I looked online for a passport service with a lead foot to get through the maze of applications and knew how to expedite without financial ruin. I talked to a charming guy named Sam with a Jersey accent working out of a shop in Florida and told him what my wishes were and where we wanted to to. He thought we could get it done in time. I checked my hair and dashed to the nearest Walgreens, my dogeared passport with stamps from New Zealand, Australia and the U.K, filled out the required documents and applications and FedExed everything to RushMyPassPort.com and began the search for affordable airfare. Right from the start, my girlfriend Michelle had planned to join us and take her 13 year old son with us to catch the Stones, some Cuban sun and plant the seeds of travel in his soul too. She had journeyed solo to South America on her own before motherhood anchored her at home. A couple days after lighting up this trip she had bowed out since her son's grades had slipped with his discovery of girls and spring in the air. Our fluent Spanish-speaking interpreter would stay stateside this time leaving Boyd and I to fend for ourselves like Lewis and Clark, sans Sacajawea. She picked up what very few travel guides on Cuba she could find at Half-Price Books and threw in her own Spanish-English dictionary into my backpack before we left. With just a little more than a week to execute this wild hair, Boyd was now hanging his sombrero in Cabo San Lucas and would call me each night to see what I had discovered in laying out this road show. In the years I've know Boyd Elder, I've never hid the fact that I was a huge fan of his album covers for the Eagles (One of These Nights, Greatest Hits, Vol. I and II) and have earned his friendship. Whenever he was out on "The Left Coast," I was his "Cowboy Cadillac Limo" driver taking him all over Hollywood looking for Billy Gibbons at the Rainbow Room or sliding a “Cheeseburger Royale” through the wrought iron driveway gate he had just scaled at Joni Mitchell’s house the deliver a late night poolside snack to his friend somewhere near Bel Air, or back home in Texas Hill Country, my Texas-plated Dodge truck was our steed with a Ray Wylie Hubbard bumper sticker "Screw you. We're from Texas!” Each and every time we went anywhere together it was always a "trip." As his "tour manager," this was going to be the trifecta bucket list wish come true: Rolling Stone in Cuba with Boyd Elder, my personal "walking rolling" historian, survivor of the greatest dominant paradigm shift in the cultural and music explosion of the early 70's, the soundtrack of my youth as well as my own generation. His album artwork affected not only my taste in art and music but would be my inspiration for my first tattoo on my 40th birthday: a painted buffalo skull that looked like some fridge art by a cross-eyed first grader by comparison. Who knew many years later, Boyd and I would be standing on the threshold of yet another Revolution, one that would not be televised nor DVR’d? This one required action. In my own mind, 90% off success is simply showing up. Nobody had any idea of what this event would mean, but we were going to find out. If you’re going to walk on water, you had to get out of the boat. Sink or swim, we were determined to bare witness. Each of the very few days leading up to our hopeful departure date(s) while checking in daily with my passport expediter, the flights available were dwindling as the fares rose. I found an Air B and B online that came with a 1953 Chevy Bel Air with driver for an additional $50 US a day. Our reservation dates were accepted and my passport would arrive the day following as Boyd and I committed to locking this trip in. We spent a couple hours on a 3-way call with the airline, Boyd in Cabo and I was sitting in my "showroom," the whirled headquarters for Suite Dreams Murphy Beds. Very quickly we realized this free wouldn’t be cheap! But, what the heck! It was "haste la vista, baby!" Hola Habana! ​A recent client of mine from Houston called and ordered a queen-sized Murphy bed, a beautiful modern style made with maple and finished in "espresso." Once our plans were set, I called them to see if I could deliver and install it 8 days sooner. No problem. And the balance was gladly would be paid in cash. Boyd arrived by AmTrak from his art station hideout in Valentine, Texas into San Marcos that morning. We'd be on the road later that afternoon for Bush Intercontinental Airport very early the following morning. We both felt like two kids in a candy store with full dental coverage. By the end of the next day, we would be in Havana, just one day after President Obama departed, more or less the opening act for the Rolling Stones. And we were going to see history unfold right before our eyes. ​On our connecting flight from Mexico City, we meet another traveling adventure-seeker, Roland von Wincklemann from Pasadena, California, a wealth management numbers cruncher with a pocket full of wanderlust too. I give him our location, since most of Cuba is still a communications frontier, with spotty WiFi and no cell services yet for the rest of its visitors. We visit like kids on a field trip going to Disneyland. Upon arrival into Havana and going through the Cuban security, most of the guards were beautiful, young female officers smiling at you as they scanned your body and politely welcomed you to Havana. For a moment, this might have been a post-9/11 security check point for "Fantasy Island." Once through security, I began searching for a cab to our casa with map in hand. I found Boyd sprawled out at the end of the small international airport on the sidewalk begging for "Agua, Agua, por favor!" I think the 3-fingers of complimentary agave/snake venom got the best of his travel. 30 Euros later our cabbie finds our B & B. The places looks like an older Hollywood neighborhood pre-gentrification. Beautiful stuccoed homes with wrought iron gates and fences sitting next to a shabby, rundown possible location shoot for the next "Flip it or Fix it: Havana” on HGTV, a real dump. Our hostess is happy to greet us and it takes a few minutes to figure out that our confirmed reservations for the next 5 days has been double-booked. “No casa” she mimed out. Our mutual friend Renate Winter is already there, arriving 3 hours prior. She has done her best to get a fix on the situation. Now I am getting an idea of how Joseph and Mary must have felt, strangers in a strange land that very special night. Arrangements have already been made back in the States by our original host, a Cuban fireman now putting out fires in Oakland, California. It's his family, in this fledgling share economy of Cuba to be our intended gracious hosts. another casa has already been arranged for us that is nearby. No problema! We take the advertised 1953 Chevy Bel Air with driver Orlando and his friend Efrain to help translate this lost Americans to the new location a few blocks away and meet a sweet woman named Aida. We are set and each of us has a room to lay our weary heads. We hear Nicolas’ recount of how President Obama was received the two days prior, his speech to the people of Cuba and Presidente Raul. But when Obama touched the shoulder of the Cuba president, Nicolas rolled his eyes to his own shoulder as he brushes away Obama’s hand in his storytelling, “No!” In my news black-out of world events, getting packed and delivering my last Murphy bed in Houston the night of the Cuban state dinner for Obama, I had missed this. Thankfully, the warm and beautiful people of Cuba weren’t so cold to the Western World’s invasion. No protocol for friendship. Only the warm smiles, warmer rum and hearts of gold were running the streets in much need of repair greeted us along the way. Friday morning, Roland met us at our casa and joined us for the ride to the Ciudad Deporiva, where an area outside had been used for several baseball diamonds, was accommodated to stage this last minute concerto. It’s an expansive field with the Stones gigantic stage set on the other side, kind of like El señor de Yasgur communal plot, a field of dreams coming true. “Build it, they will come.” Thousands of people show up 8 hours before showtime. Roland and I plow our way to the front, stage right and end up less than 10 feet from the security fence. A sea of happy faces fill in right behind us. We do not see merch tents, no food vendors or beer tents— nada! There were only two Sani-Cans stood along the side of the rusty metal rail fence soon to be overflowing as we entered. We would stake out our piece of history in the making right there for the entire day. Each of us packed our backpacks with water, snacks and wishful-thinking come true. On the LED screens scrolled various vintage Rolling Stone vignettes, videos, clips of various rock-doc flicks. The partially-cloudy skies above the throngs from the world over kept us as cool as we were ever going to be. During the long afternoon we spotted Renate up on the huge stage taking a few photos. Roland and I yelled to hear. Over the growing hum of the pulsating crowds she heard us and waved. She had her own laminate backstage show, as well as many more over the years having been taken in and befriended by Keith Richard and Pierre, Keith’s personal guitar tech. She frequently got her special invites to meet with them many places while on and off the road. Lucky woman, and she knew it. The excitement could be felt like a ground swell as showtime neared. We met two young guys from Austria in lederhosen on a 6-month South American trek, a vivacious young man in the burgeoning Cuban cellular business and his ER-doctor wife, and dozens of other happy, smiling music lovers. This was high-density living at its best. We had a front row seat to this Culture crashing in on this wobbling Communistic hold-out country. Our translators for the night: The Rolling Stones. Our common denominator would be music. It was time to turn it up! With just a few days left in Cuba, Boyd and I searched in vain for Wifi either at the Melia Cohiba or the Nacional to cinch up our departure date. The island was filled to capacity and flights were overbooked for days. We even considered swimming back to Florida or taking a homemade raft like our new friend Efrain and done two previous times without luck (That is an entirely another story I will write soon!) or renting a Hobie cat sailboat and pray for a strong northerly wind to take us home. Our Cuban pesos were dwindling away with each day. The pre-paid Air B & B reservations had yet to be fixed. We did not want to leave our friends in the lurch for their wonderful hospitality for the week-long stay that would forever changed our own worlds. While on the spotty WiFi for ten Cuban pesos, I reach out via Facebook Messenger and got Michelle on the phone. I told her where Boyd had stashed some money in my showroom and to Western Union it all, minus the wire fee. Two days later, Aida and I walked about ten blocks through the old neighborhoods to the nearest Western Union office to retrieve both her money from our original Air B&B host and the money Boyd and I would spread around to our host, Orlando and Efrain, for their services. And we tipped them during our teary-eyed good-byes with one hundred Cuban pesos each, equivalent to several weeks pay as we said our despedidas and wished we could have done much more for them. I sit on the tiled porch as El Boyd-O and the boys have hit the streets one last time in search of The Last Supper and more cervesa. I plugged in my Skull Candy ear buds and listen to "Hotel California" as I watch the beautiful Havana people and an occasional dog pass by our B & B. The Cuban sun fades away in the west and will emerge again tomorrow to a cast a new light of hope on the forgotten island as it washes away a the shadows of the Cuban Missile Crisis, embargoes and wonder and concern for our Caribbean neighbors. I was here to witness the line drawn in the white, sandy beaches of Cuba. Even Cold War babies gotta grow up sometime, right? My hopes for this land left behind and its beautiful people would remain the same, but with change comes the neon lights of commercialization, corporate take-overs, rising prices for stays, food and friendship. Cuba would be the Last Frontier of The Western World. They survived this long without us, but the change was in the air filled tonight with the scent of Korean diesel engines in the old, vintage cars and buses that continued to spew a forgotten era onto the bustling, broken streets of La Habana. The gato was out of the bag. Obama may indeed have been the opening act for the Rolling Stones, but the real stars will be the rise of spirit of the grateful Cuban people. I will stand with the rest of the world as I flick my Bic shouting, "Free Bird” en español.